Former Deputy Minister Vinayagamoorthy Muralitharan alias ‘Karuna Amman’, yesterday launched a new political party called the “Tamil United Freedom Party” in Batticaloa. 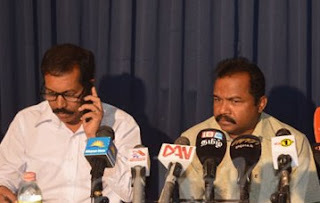 Speaking at the the inauguration of the new party at Focus Hall, Batticaloa, Karuna Amman who was the former Vice President of the Sri Lanka Freedom Party (SLFP) said the party would be based in Batticaloa and would also open branches in the North and East. He said the party would be registered soon. Batticaloa District Civil Organization President T. Wimaladas has been appointed as the General Secretary of the new party.